When you’re dealing with a topic as complex as California earthquakes (such as Sunday’s 5.3 quake near King City), it seems as if every answer only generates more questions. That’s the case with a recent NRC analysis of the area near the Diablo Canyon nuclear power plant, on the Pacific coast near San Luis Obispo. Diablo Canyon’s owner, Pacific Gas & Electric, was working with the U.S. Geological Survey in 2008 when they discovered the “Shoreline Fault,” located just a few hundred yards offshore from the plant. This work stemmed from PG&E’s Long-Term Seismic Program; the company committed to the NRC in 1991 that it would continue the program to study seismic issues and perform periodic seismic reviews of the plant. In 2011, PG&E submitted a detailed analysis of the Shoreline Fault to the NRC. Both PG&E’s analysis and the NRC’s just-published independent review reached the same conclusion – Shoreline’s shaking potential falls within what the Diablo Canyon reactors are already designed to withstand. Even with that answer, both the state of California and the NRC have asked PG&E to do more work, although for different reasons. 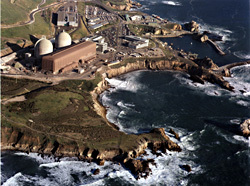 California Assembly Bill 1632 in 2006 directed the California Energy Commission to assess the vulnerability of the state’s nuclear power plants to seismic hazards. As part of the assessment, PG&E proposed a multi-million dollar study that uses powerful air cannons for 3-D mapping of the offshore area near the plant. Eighteen air guns would be towed behind a boat and used to emit 250-decibel blasts into the water over a 530-square nautical-mile area. The plan has drawn fire from biologists, environmentalists and fishermen who fear marine life from whales to sea otters and fish will be harmed. PG&E has pointed out that similar seismic surveys have been conducted elsewhere without adversely affecting marine life. PG&E has now decided to delay its seismic testing program until mid-November so it can make some changes to its work plan. Separately from the state-mandated 3-D mapping, following the Fukushima nuclear accident in Japan the NRC sent a request for every U.S. nuclear power plant to re-analyze their earthquake hazards. So, in addition to meeting the requirements of the state, PG&E must also re-analyze the earthquake hazards for the NRC. PG&E is now working with a team of independent experts to determine what should be included in its re-analysis for the NRC. The NRC doesn’t yet know if that group will also recommend the high-energy offshore surveys, which cannot be done without state approval. If the offshore surveys are done, the NRC expects PG&E will include that information in its earthquake re-analysis. If not, the NRC expects PG&E will nonetheless assemble enough updated information to complete its re-analysis by early 2015. The results of all this work will ensure Diablo Canyon remains ready to safely shut down after an earthquake. The Japanese did the very same thing and now they have a Trillion Dollar Eco-Disaster in Fukushima. If one happened tomorrow in CA, our Leaders would do the very same thing as the Japanese did on 3/11/11………………………………. Thanks for the context & links! That’s not exactly correct. PG&E doesn’t want to do this (politically, it’s an expensive catch 22). What IS true is that the California Energy Commission, California Coastal Commission, and the California Public Utilities Commission all REQUIRED this testing. That was before they realized that so many marine lives would be lost. NOW, however, backing up is difficult to do. State Senator Blakeslee and San Luis Obispo County Supervisor Gibson demand it. PG&E has all the data they need NOW. They don’t NEED high energy 3-D testing. The recent NRC letter confirms that the Shoreline fault is WITHIN the envelope of the Hosgri analysis. See http://pbadupws.nrc.gov/docs/ML1228/ML12286A313.pdf. My OPINION is that if the public demands that the high energy 3-D testing be stopped, these folks can find a way to accept the considerable data already gathered from the studies already completed: land based 2-D, land based 3-D, and low energy ocean 3-D, etc. Facts are relative dependent on the frame of reference. Engineering prudence is a moving target, updated continuously based upon failures of assumption. Our culture feeds a sense of societal and individual fear in order to maintain its ability to manipulate behavior and ensure control. Bias can be a beautiful and cherished thing. Nightmares are lessons yet unlearned. Peace. L’AQUILA, Italy (AP) – In a verdict that sent shock waves through the scientific community, an Italian court convicted seven experts of manslaughter on Monday for failing to adequately warn residents of the risk before an earthquake struck central Italy in 2009, killing more than 300 people. The defendants, all prominent scientists or geological and disaster experts, were sentenced to six years in prison. Earthquake experts worldwide decried the trial as ridiculous, contending there was no way of knowing that a flurry of tremors would lead to a deadly quake. Yes, it’s a repeat, but in deference and appreciation of all those responsible in this study and analysis; let fact and prudent engineering rule your decision over fear, philosophical biases and wild nightmares. State law didn’t require 3-D imaging, PG&E wanted it, and the state allowed the utility to spend $64 million, or more to conduct tests. You may wanna check the National Marine Fisheries to find the impact on fish and marine mammal, which are expected to be intense, and probably kill. The local commercial and sport fishing will lose several seasons too.